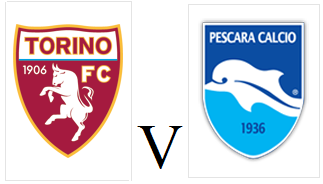 Torino will be looking for their first victory of the season when they face fellow newly promoted side Pescara at the Stadio Olimpico on Saturday evening. New signing Alessio Cerci should make his debut, whilst fellow winger Mario Santana could start after impressing as a substitute in Sunday's goalless draw at Siena. Opponents Pescara will also be looking for their first win of the season, after falling to a 3-0 home defeat against Inter last weekend. After losing a number of key players from their promotion campaign, Pescara are many pundits favourites for relegation, but after beating Toro to the Serie B title last season, they should not be underestimated. Torino opened the new Serie A season with an uneventful goalless draw at Siena, a result that immediately cancels out the 1 point deduction given to the Granata before the campaign started. Giampiero Ventura lined his team up in a 4-3-3 formation, with Giuseppe Vives joining new signings Matteo Brighi and Alessandro Gazzi in midfield. Captain Rolando Bianchi led the line up front, alongside familiar faces Alen Stevanovic and Riccardo Meggiorini. Torino dominated possession in the early stages, and Riccardo Meggiorini had a half chance in the opening five minutes, but he dragged his shot wide of the post. With chances few and far between, the next opportunity arrived five minutes before half time, but Rolando Bianchi's low shot was tipped round the post by home keeper Gianluca Pegolo. Torino's captain had another great chance at the beginning of the second half when Matteo Brighi's floated cross found him unmarked in the area, but Bianchi's header went well wide of the target. At the other end, Siena came agonisingly close to opening the scoring, but Gaetano D'Agostino's free kick rattled off the crossbar. New acquisition Mario Santana made a positive impact after coming off the bench, and good work from him allowed Riccardo Meggiorini to get a shot at goal, but once again it was off target. A draw was probably a fair result as although Torino dominated possession, they did not create enough clear cut-chances to deserve a victory. However, it was a reasonable start to their Serie A return, and they will certainly be looking for all three points at home to Pescara next week. Two teams who begin the season with point deductions meet on the opening day of the season, and both sides will believe they have a good chance to start the campaign with a victory. Torino will be without new signing Alessio Cerci who is suspended, so that should give Gianluca Sansone an opportunity to make a debut. Giampiero Ventura will have to decide whether he goes with Matteo Brighi or Giuseppe Vives to partner Alessandro Gazzi in central midfield, or he could choose to play all three players in a 4-3-3 formation. Captain Rolando Bianchi is almost certain to start upfront after his two goals against Lecce in the Coppa Italia, and if Ventura lines up in his preferred 4-4-2 line up, he should be partnered by Riccardo Meggiorini. Opponents Siena will be looking at this game as an opportunity to immediately halve their six point deduction, that was given to them as punishment for their role in the CalcioScommese scandal. Their coach Serse Cosmi is one the most recognisable figures in Italian football, and he will be hoping to get his reign off to a good start. With the 2012/13 Serie A season getting underway tomorrow, here is a brief look at the teams involved and my predictions of where they will finish. Despite being deducted six points last season, Atalanta achieved a creditable 12th place finish to comfortably avoid relegation. The Bergamo side will begin this campaign with another point deduction (this time two points) so former Torino coach Stefano Colantuono will hope that they can wipe that deficit out quickly. Whilst it is unlikely that striker German Denis will replicate his success of last season (16 goals in 32 games), he should score enough to keep them away from the bottom three. With star striker and talisman Marco Di Vaio leaving the club for Montreal Impact, Bologna may find it difficult to emulate last season’s impressive top ten finish. With talented playmaker Gaston Ramirez also being linked with a move away from the club (possibly to the mighty Southampton) Bologna could find themselves in trouble this season. However, Stefano Pioli is an astute coach, and with Alessandro Diamanti, Robert Acquafresca and Manolo Gabbiadini in the team, they should have enough to finish mid-table. After playing a number of league games in Trieste last season, Cagliari will finally return to playing in Sardinia, albeit in the newly renovated ‘Stadio Is Arenas'. Chilean striker Mauricio Pinilla scored eight times after moving from Palermo in January, and if he can continue that form then Cagliari should have enough to avoid relegation. It will also be interesting to see whether Marco Sau (who scored 21 goals for Juve Stabia in Serie B last season) can impress in the top flight. After Vincenzo Montella left the club to coach Fiorentina, new man in charge Rolando Maran may find it difficult to improve on last season’s finish of 11th. Mirco Antenucci has returned to the club after a successful spell at Torino, although it is unlikely that he will be in the starting eleven. Midfielder Francesco Lodi is one of the most creative players in the entire division, and he may need to have another productive season if Catania want to stay away from relegation trouble. After losing American midfielder Michael Bradley to Roma, and defender Francesco Acerbi to AC Milan, Chievo will be relieved to see the transfer window finally close at the end of the month. The arrival of former Torino striker David Di Michele should see him partner another ex-Toro player Sergio Pellissier in an experienced forward line. However, I have my doubts whether these two players will score enough goals to keep ‘The Flying Donkeys’ in the division. Under new coach Vincenzo Montella, Fiorentina will be keen to improve on the disappointment of last season and have made a number of new acquisitions in order to do so. Emiliano Viviano, Alberto Aquilani and Borja Valero all look like good signings, and although Riccardo Montolivo, Valon Behrami and Alessandro Gamberini have all left the club, they should still enjoy a successful campaign. After a disastrous 2011-12 season, in which they only narrowly avoided relegation, Genoa will be hoping for a less stressful campaign this time around. Defender Michele Canini has arrived from Cagliari and should therefore improve a defence that conceded 69 goals last season. Whilst the departure of Rodrigo Palacio is certainly a blow, it will be interesting to see whether Ciro Immobile, the top scorer in Serie B last season, will be an adequate replacement. With no Champions League football on the agenda after last season’s 6th placed finish, Inter should be able to mount a more serious title challenge this campaign. Rodrigo Palacio, Gaby Mudingayi, Walter Gargano, Antonio Cassano and Samir Handanovic are all solid acquisitions, and if rookie coach Andrea Stramaccioni can gel the new signings together quickly, it could be a successful season for the Nerazzurri. As much as it pains me to say this as a Torino fan, it would take a brave man to bet against Juventus retaining their title this season. Their squad has been improved with the signings of Mauricio Isla and Kwadwo Asamoah, whilst the returning Sebastian Giovinco should provide some creativity upfront. Whilst the ten month ban awarded to coach Antonio Conte could harm their chances of the scudetto, it is my view that the added fixture congestion that comes with Champions League participation could prove to be the bigger problem. Lazio President Claudio Lotito has made a bold decision by replacing experienced tactician Edy Reja with a man who has never coached in Italy before - Vladimir Petković. In addition, whilst many rivals have been busy in the transfer window, Lazio have been relatively quiet, with Brazilian midfielder Ederson the only notable addition. However, with quality players such as Miroslav Klose, Mauro Zarate and Hernanes in the squad, nobody should be writing Lazio off just yet. After the departures of both Zlatan Ibrahimovic and Thiago Silva to PSG, it will be fascinating to see how AC Milan cope this season without their two best players. Although Cristian Zapata, Riccardo Montolivo and Giampaolo Pazzini are decent players, they are not the world class replacements that the fans desired, and therefore it will be extremely difficult for Milan to mount a challenge for the title. With no Champions League football to distract them, Napoli should be able to have a more successful campaign than last season. Although the departure of Ezequiel Lavezzi is a shame, Valon Behrami and Alessandro Gamberini look to be good signings, and with Lorenzo Insigne returning from a successful loan spell at Pescara, Napoli should be contenders. New coach Giuseppe Sannino has performed minor miracles with both Varese and Siena, and if President Maurizio Zamparini is patient, then the Rosanero could surprise many this season. The importance of Fabrizio Miccoli’s decision to stay at the club should not be underestimated, and it could finally be time for Abel Hernández to breakthrough and become a star of Italian football. Sebastian Giovinco’s departure is certainly a blow for Roberto Donadoni’s men, and they could struggle to replicate last season’s outstanding 8th placed finish. However, the return of Amauri, who had a successful loan spell at the club two seasons ago could be a positive, and it will also be interesting to see how highly-rated Colombian striker Dorlan Pabón adapts to Italian football. Last season’s Serie B champions have had a difficult summer, with their three best players - Marco Verratti, Ciro Immobile and Lorenzo Insigne, as well as their coach Zdeněk Zeman, all leaving the club. However, new signings Vladimir Weiss, Jonathas and Ante Vukušić all have potential, and if they can gel together quickly, they could avoid relegation. Zdeněk Zeman returns to Rome after a successful season at Pescara where he led the club to the Serie B title, scoring an incredible 90 goals in the process. Michael Bradley, Panagiotis Tachtsidis, Mattia Destro and former Torino defender Federico Balzaretti are all good signings and should improve the squad from last season. The decision to bring back Zeman will either be a great success or a disastrous failure - there will be no middle ground. However, one thing is certain; it definitely will not be boring in the capital. After sneaking into the Serie B playoffs last season, Sampdoria hit form at the right time to beat Varese in the final, and therefore return to Serie A at the first time of asking. Samp will be looking to continue that momentum, and the acquisition of Maxi Lopez from Catania does seem to be a sign of their intent. However, new coach Ciro Ferrara failed in his previous spell in club management at Juventus, and if they get off to a poor start, he may not last long. After being deducted six points for their role in the betting scandal, Siena will have a lot of ground to make up immediately. In many ways, charismatic new coach Serse Cosmi is probably the perfect choice to create a ‘siege mentality’ within the Siena squad, and if they can pick up points quickly, they could shock many by avoiding relegation. However, with star striker Mattia Destro leaving the club, it is difficult to see where the goals will come from. After three seasons in Serie B before gaining promotion in May, the majority of Torino fans would be happy with avoiding relegation this campaign…and maybe an overdue derby victory over Juventus. The Granata have retained most of the defence that conceded just 28 goals last season, and in Angelo Ogbonna, Toro have one of best young defenders in Europe, who will be keen to show why he is so highly rated. Strikers Rolando Bianchi and Riccardo Meggiorini have scored plenty of goals in pre-season, and if they get the service from new signings Mario Santana and Alessio Cerci, they should score the goals to keep Torino in the division. After drawing 1-1 in Tuesday’s Champions League qualifier against Braga, Udinese are well placed to reach the group stages. If that does happen, then their small squad may struggle to cope with the fixture congestion, and their league form may suffer. Despite losing Mauricio Isla and Kwadwo Asamoah to Juventus, their incredible scouting system has continued to find good players at little cost, and Brazilian midfielder Willians is a player to keep an eye on. Antonio Di Natale will obviously continue to score goals at an extraordinary rate, but if he has to be rested for European fixtures, then Udinese may struggle to score goals. As regular followers of the blog will know, at the end of each match preview I usually give my own individual prediction of what I believe the score will be. Whilst I have had mixed successes doing this, I've decided it could be an idea to open this up to anybody else who wants to try and predict Torino's results, and at the end of the season, whoever is most successful, will win a small prize. 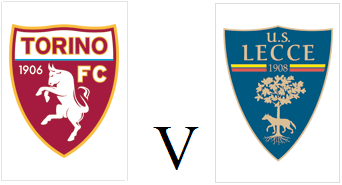 Predictions will only count for Torino's 38 league games this season, and all predictions must be sent to me either via the comments section on the blog, or on Twitter by the time the match you are attempting to predict kicks off. Scoring will be as follows - a correct prediction will earn three points, predicting the correct margin of victory will earn two points, and if the result is correct, that will earn one point. For example, by these rules, if you were predicting last weeks Coppa Italia match against Lecce, if you had put down your prediction as being 4-2 to Torino(the actual result) you would have gained the maximum three points. If you thought it would be 2-0 to Torino, you would get two points, and if you thought the result would be 1-0 to Torino, you would gain one point. Hopefully that all makes sense, there is no obligation to make a prediction for every match, and I will try and remind everyone to put their predictions in ahead of each game. Cerci arrives at Torino after a difficult two year spell at Fiorentina, where he impressed and infuriated the Viola fans in equal measure. That being said, the former Roma winger is undoubtedly a talented player on his day, as emphasised by his tally of twelve goals in 46 games during his time at Fiorentina, as well as the fact that Manchester City manager Roberto Mancini is apparently an admirer. Torino have paid a reported €2.5m to sign Cerci on a co-ownership deal, and the player now reunites with Giampiero Ventura, who was his coach at Pisa in the 2007-2008 season. It is hoped that being reunited with his former coach, who has also been described as a 'mentor' to the player could lead to Cerci becoming a more consistent performer. After finding myself with a lot of spare time on my hands after leaving University in the summer, I decided to write a short book (in English) detailing Torino's recent history, from 2006-2012. Whilst this has not been the most successful period in Torino's history, this book recounts all the memorable events that have occurred in the past six seasons - such as on-pitch brawls, players being attacked by ultras, and games being postponed because of floodlight failure. You can download the book in PDF format - here, and best of all it is absolutely FREE, just press file, and then download, from the menu on the left-hand side. If you have any problems downloading the book, please let me know and I can send your a copy via email. For Italian fans of this blog, I am planning to release this book in Italian (albeit via Google Translate) so if you would like a copy in your native language, let me know and I will make one available for download. If you prefer to read your literature via electronic devices such as iPhones and iPads, you should still be able to view the book. By downloading the PDF, and then emailing the file to yourself, you will then be able to open the email and read the book on your chosen device. Now as I said previously, the book is absolutely free to download. However, if you enjoy reading the book and want to make a small donation to charity to show your appreciation then please feel free to donate. As a Southampton fan, my chosen charity is the LJS Foundation, a charity that was created by Saints striker Billy Sharp, and a charity wristband can be purchased for just £3 on Ebay. However, if you wish to make a donation to a different charity that is absolutely fine, and please remember it is just a voluntary donation if you wish to do so, there is absolutely no obligation to donate money in order to download the book. Torino progressed to the next round of the Coppa Italia after a convincing 4-2 victory over Lecce on Saturday evening. The Granata lined up in a familiar 4-2-4 formation with Rolando Bianchi and Alessandro Sgrigna upfront, whilst new signings Alessandro Gazzi and Jean-François Gillet made debuts. Torino made a perfect start to the game as they took the lead after just two minutes, with Alessandro Sgrigna scoring from the edge of the area after good work from captain Rolando Bianchi. And just twelve minutes later, the home side doubled their lead when Sgrigna's cross was diverted into his own net by unlucky Lecce defender Stefano Ferrario. Despite being 2-0 down, Lecce did create chances and debutant Jean-François Gillet had to make a good save to deny striker Daniele Corvia. With just five minutes to go before half time, Lecce did get a goal back as Brazilian striker Jeda fired past Gillet from close range. Subsitute Mario Santana, who was also making his debut, came close to restoring Torino's two goal lead but his header from Alen Stevanovic's cross hit the post. But Toro did not have long to wait for their third goal, as once again Stevanovic provided a cross from the right, but this time it was turned in by Rolando Bianchi - with the aid of a slight deflection. Lecce reduced their arrears moments later when Kamil Glik conceded a penalty after fouling Corvia, and the striker converted the penalty himself to make it 3-2. However with fifteen minutes remaining, the result was put beyond any doubt when Rolando Bianchi scored his second goal of the match after converting substitute Riccardo Meggiorini's low cross. New signings Matteo Brighi and Mario Santana both had chances to increase the margin of the victory in the closing stages but the game ended 4-2. This match was a good test for Torino ahead of their first league game of the season against Siena next Sunday, and a similar result would be most welcome. 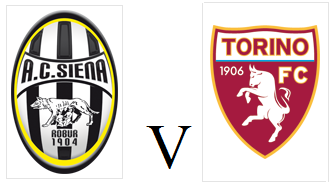 Torino will play their first competitive fixture of the 2012-13 season as they face Lecce in the Coppa Italia this evening. This game will give a number of summer acquisitions an opportunity to make their Torino debuts, and players such as Matteo Brighi, Alessandro Gazzi, Mario Santana and Gianluca Sansone are expected to feature. After impressing in pre-season, strikers Rolando Bianchi and Riccardo Meggiorini should start the game, and it will give both players an opportunity to impress ahead of Torino's first league game against Siena next Sunday. Opponents Lecce have had a hectic start to the season, after being relegated to the Lega Pro Prima Divisione as punishment for their role in the Italian match-fixing scandal of last season. Therefore, this cup game should provide a welcome distraction for a side that has dropped down two divisions in just twelve months. Torino have finally completed the signing of midfielder Matteo Brighi from AS Roma on loan until the end of the season. Brighi had been training with Torino for the last month, but coach Giampiero Ventura wanted to ensure that the former Italy international had fully recovered from the injury he suffered whilst on loan at Atalanta last season. The midfielder's impressive performance in Thursday's friendly with Getafe (where he provided a fantastic assist for Rolando Bianchi) seemed to assure everybody at the club that he is now fully fit. This acquisition will provide Toro with some much needed know-how in the vital midfield area, and Brighi has top flight experience in abundance, having made at least ten appearances in each of the last twelve Serie A seasons. As expected, Torino have completed the signing of Uruguay defender Guillermo Rodriguez from Cesena on a permanent deal. Former Peñarol defender Rodriguez moved to Cesena last season, and played 28 matches in Serie A, but after they were relegated, he has been forced to move on. Although primarily a central defender, Rodriguez can also play at full back, and he will be hoping that both he, and countryman Pablo Caceres (who signed a few days ago) can make a significant contribution to the Torino cause this campaign. Guillermo has signed an initial twelve month contract, but if the Uruguay international impresses, there is an option to extend his deal for two further years. Torino have completed the signing of Uruguayan defender Pablo Caceres, who played over twenty matches in La Liga for Mallorca last season. With current left back Salvatore Masiello in danger of a heavy suspension for his part in the Calcio Scommese scandal, Toro were in need of more cover in that position, and Caceres seems to fit the bill. Although he has never played in Italy before, at 27, Caceres should have the experience to cope with the rigours of the Italian game, although it may take a while for him to regain full fitness. After Damiano Ferronetti rescinded his contract just days after signing with the club, Giampiero Ventura was in need of more defenders, therefore Caceres, and his countryman Guillermo Rodriguez (who should sign on loan from Cesena soon) should provide the Toro coach with a variety options. Torino will begin the 2012/13 Serie A season with a one point deduction for their role in the betting scandal (Calcio Scommese) that has rocked Italian football in recent months. Whilst it has been difficult to find out information about why exactly Torino have been given this deduction, it appears their involvement seems to centre around former player Alessandro Pellicori, who looks to have participated in this scandal. Therefore, on Wednesday afternoon the FIGC accepted a plea bargain from Torino - a one point deduction and €30,000 fine, and whilst this does not count as an admission of guilt, it is likely that the Torino hierarchy accepted this punishment so as not to risk a larger points penalty if it had gone to trial. It is obviously not ideal for Torino to begin their return to Serie A with a minus points total, but this deduction can easily be wiped out in the first match day, so fingers crossed that will be the case. Two other Serie A teams have also received points penalties, Atalanta (-2) and Siena (-6), so Torino will not begin the season at the bottom of the table.